John Davison: What's hotter? GTA IV PS3, or Xbox 360? What's hotter? 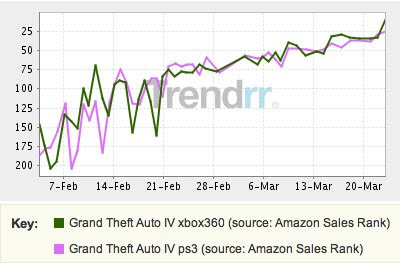 GTA IV PS3, or Xbox 360? Neck and neck, pretty much. Certainly not showing the huge delta that a lot of fanboys no doubt expect. This is just Amazon of course, so it's not an accurate display of the entire market - but it's certainly an interesting snapshot. Hello, just dropped in to checkout your blog and also introduce our Grand Opening for www.annaimports.com . We offer the ultimate superb selection wholesale of handbags, purses, wallet, Quilted bag, with the highest quality and the absolute lowest prices and that's a promise. We extend our invitation for you to stop on by and check our website out at : www.annaimports.com Thank you and have a great day! Hi there, really enjoyed your articles. I think both PS3 and Xbox360 are great, but many believe PS3 has greater potential. Only time will tell. 360 tends to overheat all the time. Its a bit troublesome. Anyways, come visit us for wholesale handbags. We have a lage selection of wholesale handbags available.